Award Alert: Virgin Atlantic Upper Class without surcharges! So earlier Delta decided to buy Singapore’s 49% ownership of Virgin Atlantic. The partnership details are here, and we can start to see VS award availability bookable with DL miles trickling in. If you want to book Virgin Atlantic Economy class, you are probably better looking at Virgin Atlantic miles transferred from SPG or Chase UR as they have permanently reduced their fuel surcharge. I am extremely curious about this partnership as I have read great things about the Virgin Clubhouse, so since that One Mile at a Time mentioned that certain VS routes have no YQ, I was pretty interested. So I did a few searches. 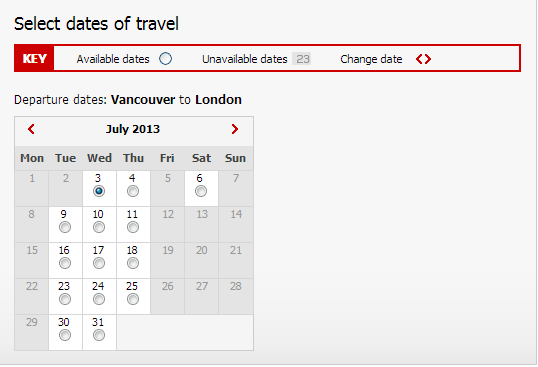 From what I see, the Virgin Atlantic Upper Class space is not available between London and the US. So I’ve seen space available from Manchester to Orlando, London Heathrow to Vancouver, and London Gatwick to several Caribbean destinations. I still can’t seem to puzzle out what subset of Virgin Atlantic space delta has access too. But there are certainly a few dates available with something like YVR-LHR which is surprisingly not bad for a long-haul west-coast to london flight. It would be nice if they release upper class award space between the US and London, but nonetheless this is pretty nice. Not to mentione that Alitalia now has the new staggered full-flat business class, and there are some really good options doing TATL with Delta Skymiles. This is the raw data – the dates that are listed is the space that you can see when searching directly with Virgin (and their online search engine) like so. I got lazy after doing searches for YVR-LHR and vice versa, but here is basically what Delta miles can get you. The dates listed below are all available with VS miles, however the dates that have been crossed out are the dates where Delta does not show availability. With Delta there is zero YQ on this route and maybe around $20-$40 in airport taxes and fees one-way (originating YVR). I did a few searches, and the space for this route seems to match up with all the award space that Delta has. Also the Caribbean routes do not have YQ either, which is great. Of course leaving LHR you are tacked with the APD, so it is definitely easy to just add a intra-Europe leg, leaving a less than 24 hour layover in LHR and saving around $100. I am definitely not an expert with delta, and I find the engine really clunky and dumb (no duh), but if I can tolerate their “flights sold out” and “dates not available” and lying award calendar, then the value of Delta miles have really gone up, especially given that they accrue at a higher ratio than other miles with Canadian credit cards. Since in my opinion, the VS overall experience (including ground services) would be better than most if not all other TATL services (maybe excluding SQ J IAH-DME/JFK-FRA, NZ LAX-LHR, and even AA JFK-LHR with 77W) and being able to redeem without YQ is absolutely amazing. We will definitely see what happens and if they will change this in the near future. I believe the 13000 miles deal on Virgin Atlantic was only a short promotion that ended in mid-June. I am also finding space on the LHR JNB.